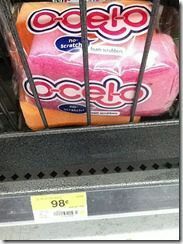 O-Cel-O Scrub Sponges only $0.48 w/ Coupon! Head over to Coupons.com to find a new sponge coupon. Bring it to Walmart to score a good deal on them! Thanks for the pic, The CentsAble Shoppin!